From all-time favorite potato chips and hash browns to simple baked potatoes, the culinary scope of potatoes is quite versatile. The truth is that you simply can’t do without potatoes. Just picture what would your next Thanksgiving dinner would be like without the side of classic mashed potatoes. Since potatoes are a kitchen staple, people tend to stock up on them. Of course, a constant supply of potato cheese balls can't hurt. But if you don’t store them the right way, they may spoil before you eat them, which is a waste of both food and money. 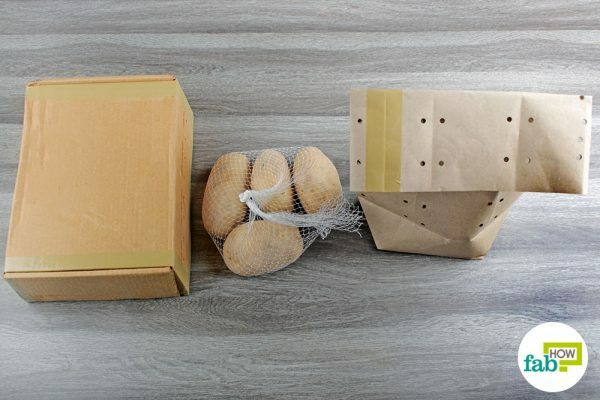 If you’ve been refrigerating these tubers only to see them quickly spoil, read on to learn the right way to store potatoes to keep them fresh up to 1 year – whether they are store-bought or homegrown. You’ll get the best results with clean, smooth and firm potatoes that have unbroken skin without any cuts or discoloration. If you’ve grown your own potatoes, you’ll need to cure them first, especially if you’ll be storing them in mesh bags or newspapers. Curing toughens the skin, which reduces the chances of mold and rot, thus extending the storage life. To cure them, lay the unwashed potatoes on a layer of newspapers in a cool (50° F to 60° F) and dark place for two weeks. Then, pick a method below for storing them. For either store-bought or homegrown potatoes, here are the basic storage requirements. Potatoes require cool, dark and dry conditions for long storage. Your refrigerator is too cold and humid, which is why refrigerated potatoes become mushy and spoil faster. The ideal temperature range for storage is 45° F to 50° F.
Good air circulation is also required for long storage. Potatoes emit carbon dioxide, even during storage. Lack of air circulation allows the carbon dioxide to build up, which causes the potatoes to decay. Potatoes grow under the earth, protected from sunlight. Any exposure to sunlight after harvesting or during storage can make them turn green, so it’s important to store potatoes in a dark area. The green color indicates buildup of solanine, a bitter substance that can be toxic when ingested in large quantities. Remove any green portions from the potatoes before cooking them. 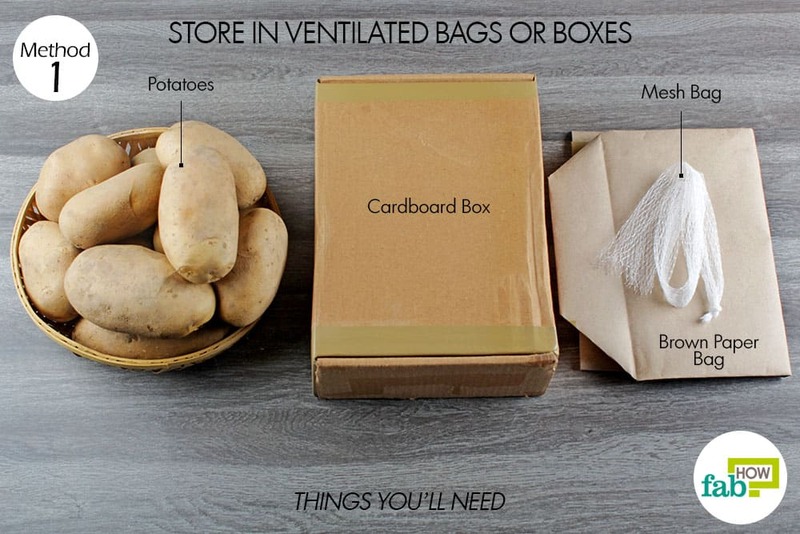 Keeping the required conditions in mind, here are three easy methods to store potatoes to keep them fresh up to 1 year. Go with the method that suits you the best. The easiest way to extend the shelf life of your spuds is to store them in an unheated, dark basement inside airy bags or containers. Mesh bags, perforated brown bags and even cardboard boxes work great for this purpose. 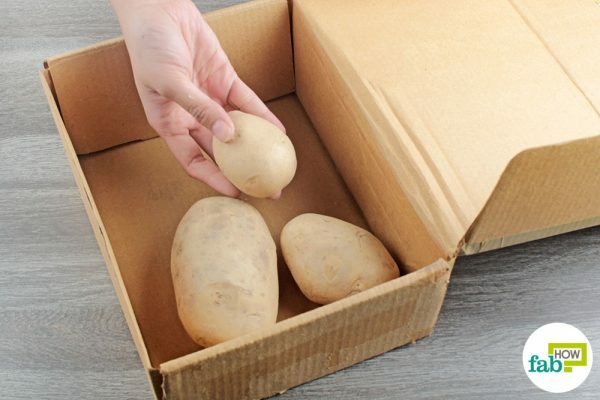 You can keep your potatoes good for about 4 to 6 months with these storage methods. 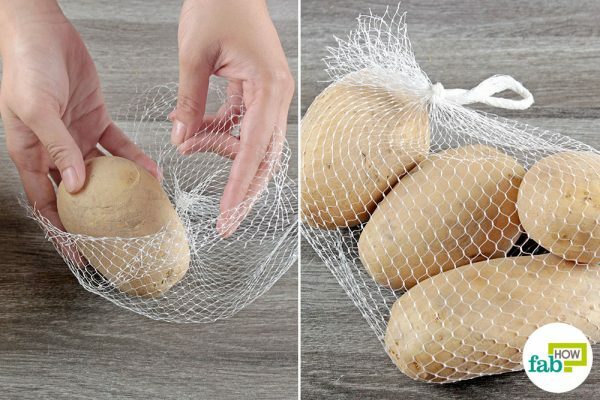 Simply place the potatoes inside a mesh bag and secure the end with a knot. Store the bag of potatoes in a cool and dark place. Use a hole punch to make holes in a brown paper bag. The holes should be evenly distributed throughout the bag. Put the potatoes inside the perforated brown bag. 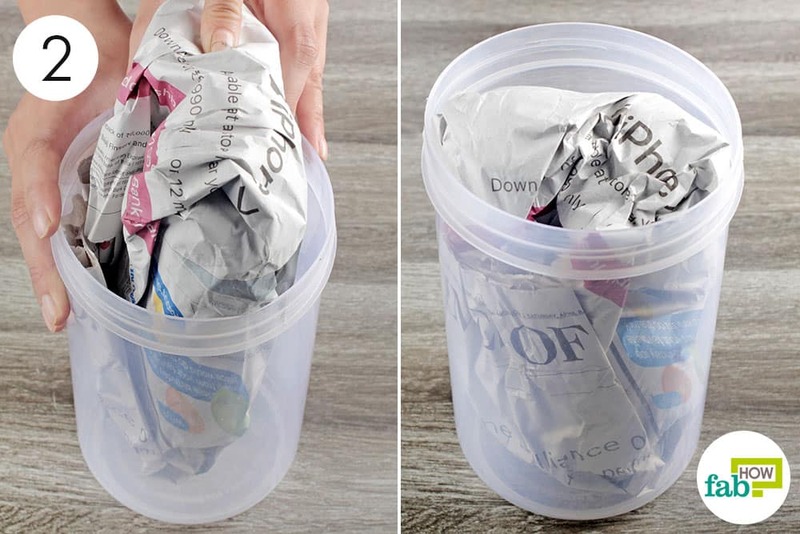 Secure the opening by folding down the top of the bag. Store the bag in a cool, dry and dark place. You can also store onions this way. Put the potatoes in a cardboard box and close it shut. Make sure that the box remains ventilated after putting on the lid. If your box is airtight, you can increase ventilation by perforating the sides of the box. 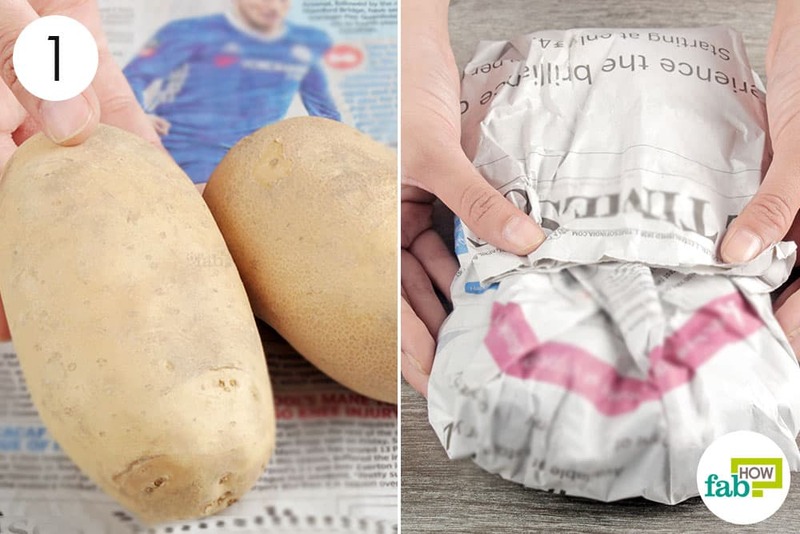 Wrapping your potatoes in newspaper is another good way to store them. 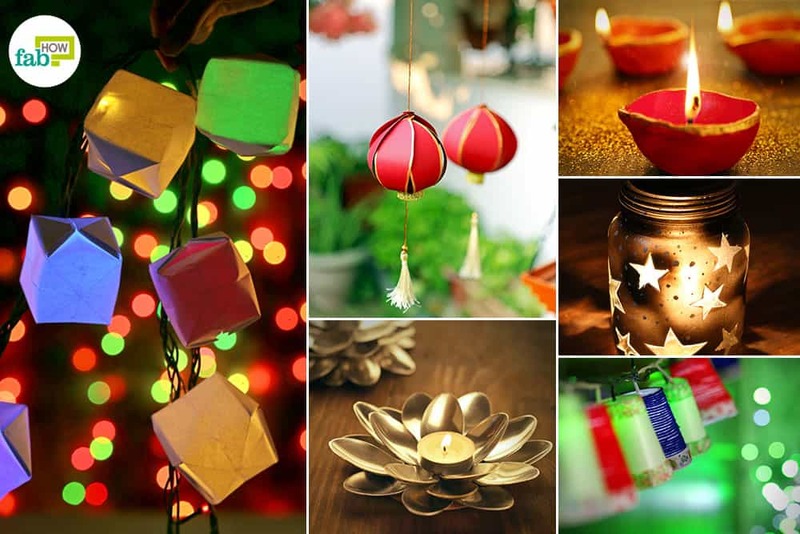 This method works especially well for those who live in hot and humid climates. Storing potatoes in newspaper allows them to breathe, while keeping them insulated. This helps maintain the cool and dry conditions required for a long shelf life. 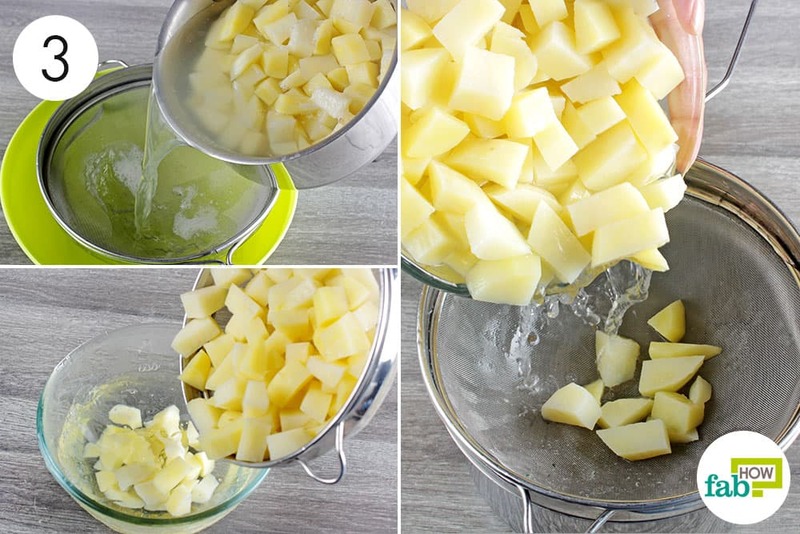 You can store your potatoes to keep them fresh for 6 to 8 months with this method. Wrap 4 or 5 medium-sized potatoes with a sheet of newspaper. Wrapping separate, small batches in newspaper will minimize the chances of bruising and decay. 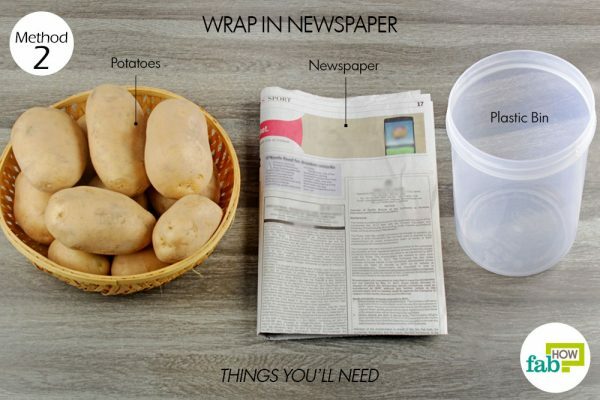 Place the newspaper-wrapped potatoes into a plastic bin. If you’re storing a large quantity of potatoes, consider using an old laundry basket for this purpose. Place the plastic bin in an unheated, dark basement. Blanching and freezing is the way to go when dealing with most veggies, as blanching preserves their nutritional value. Just like mushrooms, you can also blanch and freeze potatoes for long-term storage. Potatoes stored in this manner keep well for about 1 year. 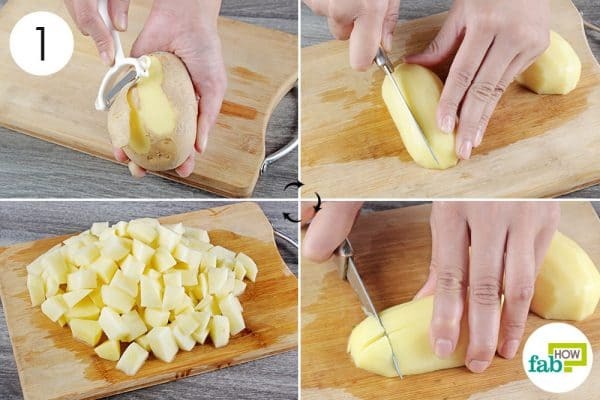 Peel the potatoes with a vegetable peeler and remove the eyes. Dice the peeled potatoes. You can cut big or small pieces, depending upon your preference. Pour water into a pan placed on a stove or hot plate. Put in the diced potatoes and let the water simmer gently on low heat for a few minutes. The simmering time will vary according to how many potatoes you’re doing in a batch. The potatoes should not be cooked completely. When poked with a fork, the exterior should be soft, but the center should be hard. 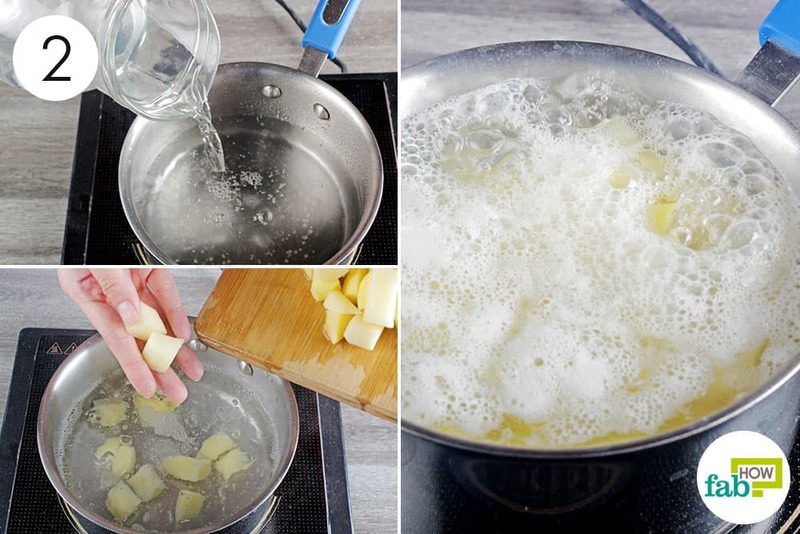 When the potatoes are done, use a colander to drain off the hot water. Immediately put the potatoes into ice water to stop the cooking process. Let the potatoes sit in the ice water until they’re cool to the touch. If the water becomes warm, add more ice to it. Use the colander again to drain off the cool water. Let the potatoes dry in the colander. 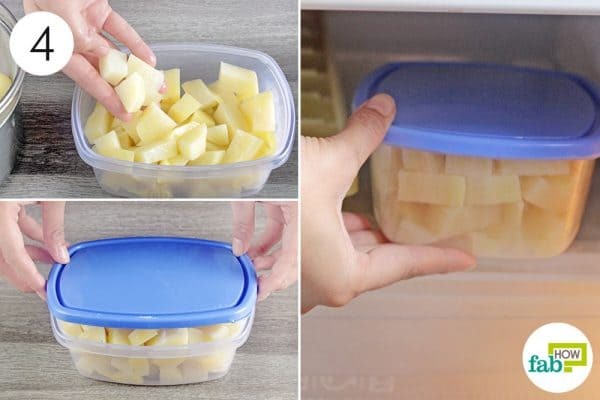 Put the cool and dry potatoes into a sealable, airtight plastic container. Put on the lid and pop the container into the freezer. Put them at the very back of the freezer to keep them fresh longer. 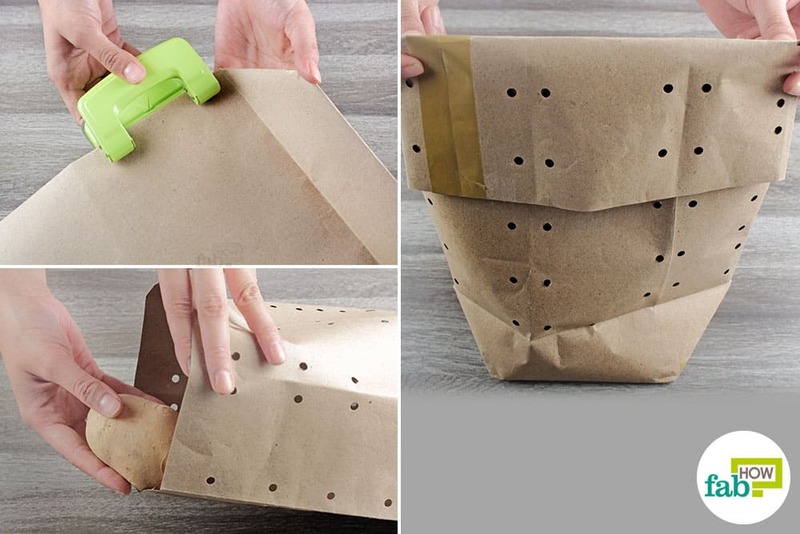 Fold the brown bag over to make two sets of holes in one pass. Depending on the capacity of your hole punch, you can make multiple sets of holes in a single attempt this way. 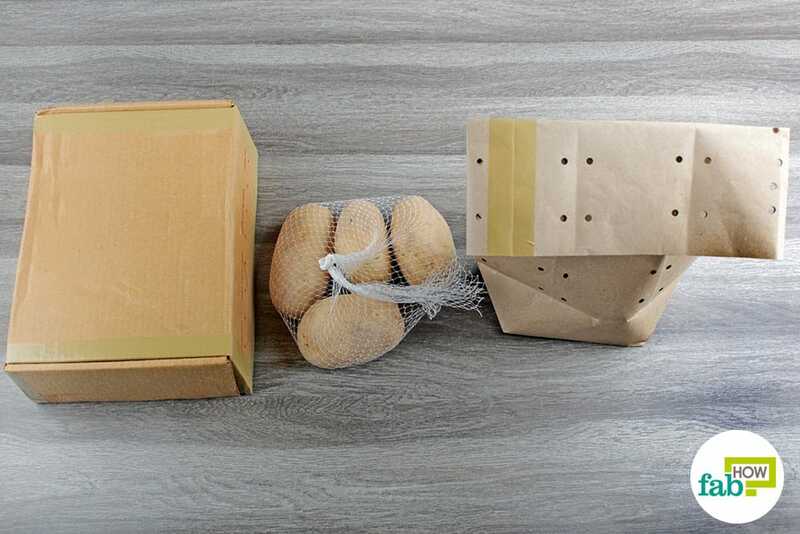 You can also use perforated plastic bags to store potatoes to keep them fresh. Instead of wrapping potatoes in newspaper and storing them in a plastic bin, you can store them in shredded newspaper in a ventilated crate or bin that’s lined with newspaper or cardboard. If you want to peel and dice your potatoes but blanch them later, put them in a bowl of cool water to prevent oxidation. 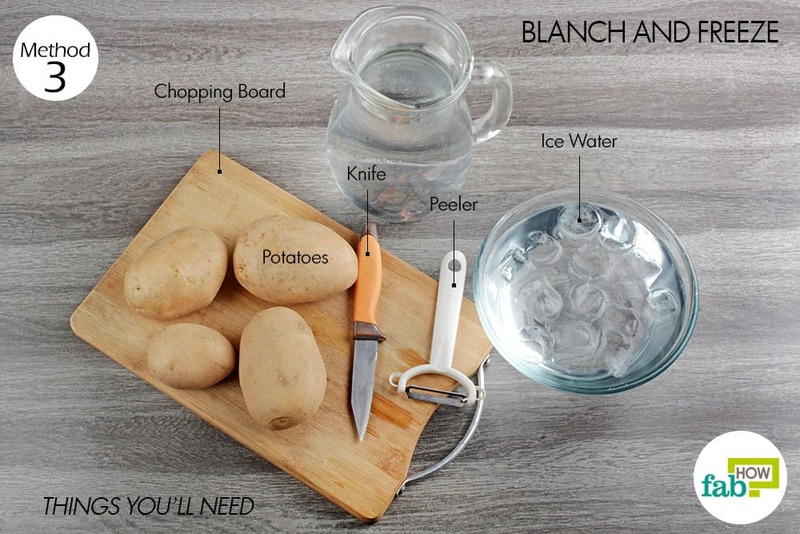 This is also helpful if you’re going to blanch a large batch, as the oxidation process will begin by the time you’re done peeling and dicing all the potatoes.